@Pocket Fox. Yeah, I'm totally with you there. I'm convinced GTA:O really thrived because it appealed far more all round. I'm just hoping to learn either way if other lobby choices are coming. It'd be a huge shame if not as without, I'm out and many of my buddies too, some of which would buy gold now and then. Such a shame. 3. Join a friend through PS dashboard. Two Alerts should be stacked. 5. Yellow mission circle should appear now, enter it and back out. (*) If you start with posse (up to 4), only your posse will be in the session. If you do it solo with matchmaking, the session will be limited to you and 3 randoms (appearently they are in the mission). EDIT: Only friends can join you if you opt for former. I forgot to mention, if you've done the glitch, members (and then you) have to leave the session and then come back again. I just want to point out that PvP Showdown / Free Roam Events have much more risk involved than PvE Story Missions, Stranger Missions and Gang Hideouts. But it does make sense for more risk = more rewards. PvE content is too easy in this game, like having a success rate of 99%. PvP isn't that easy without practice, and can't always win. Every time someone poke their head out and can get killed instantly, that isn't easy and a lot of risk. So yeah, it makes sense here that PvP would reward more. Success rate means little too. We already know items are gold only and that many play a more casual game through having busier real lives, if they don't have the time to play so much, they may buy gold regardless of playstyle. Plus, as Jason said, it's not always about earning the money. The PvP modes here have restrictions and are very limited compared to freemode. As many have shown on these forums, they enjoy freemode to fight in too. It's easier to play posse vs posse for example without having others getting involved, much like a racing crew does in GTA:O. It's all about us having a playground to freely play in more than anything. No-one's earning gold and would be blasting through ammo too. So many dynamics to session choice. Though of course, some will just enjoy their game however they can even if that means just earning money with a high success rate, if R* were truly worried about that, the PvE missions wouldn't exist, IMHO. Yeah You and Jason was spot on. People not only want to earn money, but want to earn it differently to keep the game fresh, whether it be through PvE or PVP and right now the game doesn't have it yet. I'm hoping this game will eventually blossom into something great with variety.....I just think we are experiencing growing pains right now that will take some time to pass over. That image they used for Fools Gold looks like it was made in 5 seconds in Microsoft Paint. Serious GTA Online flashbacks there ... I'm still squatting in a corner from looking at it. So - are we now on a weekly update schedule? Next release this coming Thursday? If so, what does everyone expect / hope to drop? I'd like to think so. New showdown game mode(s). Exclusive clothes unlocked. Looks like RDO has the Tuesday spot now, GTAO moved to Thursday. I'm hoping R* start to unlock clothing. Pelt Half Chaps, Tied Pants and Benbow Jacket are on my shopping list. I also wanna try the high morning tail coat. It looks like vampire-ish, black with inside being red. There's the fur gloves too. There's﻿ the fur gloves ﻿too. I'd forgotten about those. I better go back to Story missions and get some more Gold. On a slightly related note, I really wish we had more outfit slots, or even that we could store 5 custom outfits instead of 3 custom + 2 pre made. I've just requested from their feedback page that 10 outfits be the minimum, 15 - 20 via upgrade. Probably asking too much. Still, I agree with you that 5 custom outfits should be the least we're allowed to have. I genuinely thought my upgraded saddle bags were still bugged after other players reported that theirs were fixed. I only discovered outfits 4 and 5 when I accidentally pressed R3 over a pre bought outfit. It must be a bug that the 4th & 5th saved outfit slots currently only save pre bought outfits. Surely? I'm jumping on your feedback bandwagon, 10 outfit slots should be minimum. Just got my 500k in GTAO for 2 step verification, anybody see the gold show up yet? Just logged into gta and also got mine!! Thanks for mentioning, I thought it would take longer. I received my 10 Gold Bars 3 hours ago with a message from R* during the loading screen and a post on Social Club. I now have 98.57 Gold Bars and tomorrow I will finally officially reach the 100 Gold Bar mark. To get the spinner do we have to complete 5 daily challenges indiviually...like if you complete an entire days worth you get the spinner...or is it 5 daily challenges all 7 of them. I read it to mean complete all 7 daily challenges 5 days this week...but now I am starting to think its just 5 individual daily challenges. My experience after finally decided to try this new update after more than one month without logging in. Went to free roam to start where I left off and got the 10 gold bar notification, which is nice as I've setup the two step verification earlier but right after that message came another with a connection error. Back to the menu, try "Free Roam" again and finally I'm in, spawned in Valentine and two players (blue blips) were really close. One of them waved and the other pointed a rifle at me but didn't shoot. Called my horse and popup the map to see where my camp was as I wanted to collect the goodies announced in the newsletter. It was near Tumbleweed (damn you Cripps) so I decided to ride there, enjoy the sights and get into the mood again. One of the two players who "welcomed" me was following (can't tell which), I didn't bother with him just mind my own business. Right after crossing Dakota River he lassoed and killed me with his pistol. Hmm, time to try the new parley system (10 minutes, okay). After collecting the package in the camp, which didn't include the special ammo maybe because I didn't unlocked it yet, went to find a treasure as I had map from level 25. It payed only 0.4 gold bars and $46, think the previous ones payed a lot more (2x) but I could be wrong. Went to north St. Denis to hunt as I've always done, found a couple Herons, alligators, all good but for the first time saw a message that I couldn't carry more animal parts. Never saw that message before and I grinded hunting before. Went to the butcher, sold the stuff with no problem. Played a couple of showdown series large and got trashed as I barely could hit anyone and when I did they didn't die. Free roam again, went to the see the new clothes, nothing special or good for me, went to the barber in St. Denis to try the stubble again but no good. Got connection error message right after and went to bed. 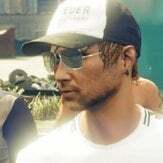 Bad things: connection errors are still a thing (3 disconnects in less than 2 hours), R* nerfing all the things that gives you income (including carrying less stuff), Cripps is still a creep, stubble beard still not working, lack of things to do. Maybe I'll give it another try when there's more things to do. Have they reached Todd Howard levels yet? Not even close. Bethesda uses a heavily duct-taped version of the same engine they've been using for the past 20 years, resulting in one of the main questlines in Skyrim being cut because the engine couldn't handle mass NPC battles, and most of the NPCs in Fallout 76 being cut because the engine couldn't handle many NPCs and multiplayer at the same time. They're used to the engine and don't want to change it, which would be fine if they stuck to making 2000s-era games, but they're designing games outside of their limits. Rockstar is at least willing to get with the times and change things when needed. They switched to their current engine after GTA SA. Lays on them like a dragon. Question - I understand Peak Condition has been altered. However, is it just me or is it bugged? "Increases damage inflicted based on your current Stamina. Inflicting much more damage when Stamina is full. Additionally, sprinting uses less Stamina." If you're at max stamina, the card light doesn't come on (indicating it is not in use). It only comes on when you dip below max stamina and seems to stay on regardless what stamina you have, as long as it isn't max. Tested this by continually sprinting. Max stamina - card disabled. Anything less than max until my stamina was drained - card enabled. I really hope they do stuff like this spinner thing again, really gives incentive to do the daily. I agree to an extent. Eventually, the vast majority of the playerbase will have the same sh*t. Meaning things like explosive ammo, though that's not necessarily a good thing. At least there's no orbital cannon, that's a plus. The card seems to light up for both of its benefits, lower stamina drain while sprinting and damage increase. I use Peak Condition 3 and when on horseback, so with max stamina, the card lights up as soon as I land a shot (or second shot?) on target, then stays active for as long as shots are landing, on single or across multiple enemies as long as they are in quick succession. I can't remember whether this is the same as when on foot, but I'd hope so. I'm also unsure whether the damage stacks with Horseman 3. Just seems overly complex for my simple brain. Previously, it was easy to follow - above 75% stamina, card is enabled.